Dragon is hunted by a massive alien spaceship and figures that the best way to avoid its blasts is to climb aboard the vessel. He leaps atop the extraterrestrial craft before punching a hole into its exterior and climbing inside. 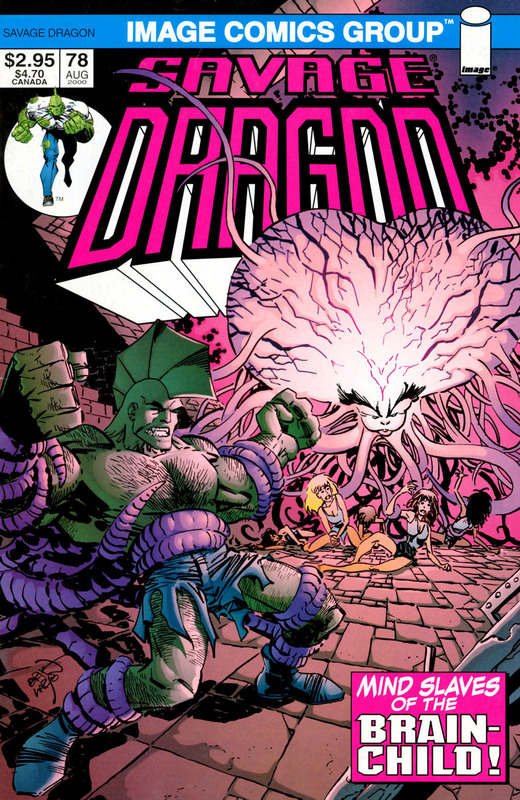 Dragon is surprised to find that the crew are the Dreadheads, the android minions of Lieberheim’s late dictator, Dread Knight. He fights against these robots whilst noticing that circuitry is coming out of the walls as if they were alive. The machinery transforms into the visage of CyberFace who is confronting the hero after his previous attempt to assassinate him. Dragon has no idea what his old enemy is talking about and is confused as to why CyberFace is even still alive. The villain rants about how Dragon failed to even stop him from claiming control of the Vicious Circle and that he will not let him slip through his fingers again. The entire vessel starts to explode as Dragon races towards an opening and leaps clear. The massive explosion propels Dragon even faster towards the surface but he cannot halt his progress and accepts his fate; impacting into the ground with incredible force. Dragon climbs free of the crater he had caused and runs away from the spaceships that are seeking to confirm his death. He considers how CyberFace could possibly still be alive and whether or not it is him that is control of the planet. Dragon starts to feel quite desperate as he has no food, shelter or friends to call upon for help. As Dragon starts to search the shattered landscape for a decent place to hide, he remembers something that WildStar had said to him. The fact that WildStar had come to his and Jennifer Murphy’s old house indicates that at least Dragon had a relationship with her in this reality. He finally comes across a heavily looted general store. Dragon comes across a decayed corpse whose wallet identifies him as Terry Fitzgerald, no one that he has heard of before. Dragon opts to remove the pants and shoes of this poor unfortunate whose body has been pinned down by a heavy piece of shelving. He dons the clothing before pocketing the cash from the wallet, just in case paper currency is still valid in places. Dragon then notes that there is not enough privacy in the store and goes in search of somewhere else to lie down for the night. He soon comes across a basement apartment with a mattress inside and settles down to try and get some sleep. It is not long before the exhausted hero has passed out, unaware that giant worms have slithered into the apartment and attached themselves to him. Dragon experiences a vivid dream where he is reunited with both Jennifer and Angel Murphy and embraces them both. He soon realises that he this is not real and awakens, just as three of the worms attack his face. Two pierce Dragon’s eyes while he closes his mouth in time to bite a third in half. Dragon punches these creatures into a bloody paste despite his temporary blindness but is now overwhelmed by rock monsters that come out of the very ground. Dragon manages to destroy these foes which cause their creator to panic. His eyes heal in time to avoid obliteration from a giant figure created out of pure mental energy. Dragon is then attacked by four innocent women who have become slaves to their bizarre captor. The building they are in starts to crumble due to all of the damage caused by the conflict and Dragon leads the women out to safety. They explain that the Brain-Child had been unable to consume solid food and so it used its mind-worms to break down victims into nourishing slush that was then fed to the slaves who then passed on their milk. The Brain-Child is left buried beneath a huge pile of rubble and Dragon leads his new companions to safety.